Watching this beautiful festival of agriculture and community, the Karen New Years Festival, about which I had heard little, I was struck by the fact that this dancing is very dangerous back in Burma, the people who celebrate this holiday are sometimes savagely persecuted, even killed. 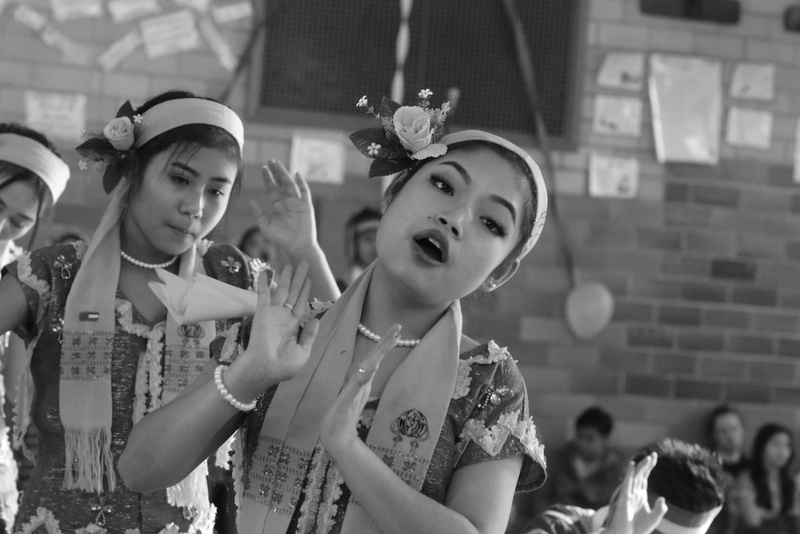 The children of Burma, refugees now, work hard all year to practice their dancing and do honor to their culture and heritage. They are dedicated, hard-working and diligent, they spend little time on Facebook and many hours rehearsing, they work in perfect harmony. What impressive kids, I thought, how lucky we are to have them here. They gathered in Albany today from all over the Northeast to celebrate their banned holiday, a simple celebration of a new crop, there is absolutely nothing political or subversive about it. The descendant of refugees myself (my people came from one of the true “Shithole” countries of the earth), I am returning to the refugee experience and working to get to know the new refugees and understand their lives, as well as my own. A refugee used to be a person drive to seek refute became of some actions taken or political opinions held or expressed. The meaning of the refugee has changed. Now, the “refugees” are those people so unfortunate as to arrive in a new country without means or possessions and who need help from refugee committees, governments or good Samaritans. The refugee committees are overwhelmed, it seems to be up to the Samaritans. In our country, government is withdrawing support from the refugees and is seeking to slam the few doors open to them shut. All over the world, the new refugees face hostility and indifference, and perhaps they always did. It seems pretty virulent right now in our country. To be a refugee now, you are most often innocent of politics or activism, most often you are in the wrong place at the wrong time minding your own business. There is a hurricane or tsunami or typhoon or earthquake. Or even more likely in or time, genocide, tribal or religious conflict, the horrid maneuverings of dictators or superpowers, civil war or coups and revolutions. Most of the refugees I have met were innocents driven from their homes and lives and pushed into dreadful refugee camps where they spend years hoping for a new life. The lucky ones were chosen by the U.N. or refugee groups and got to Europe or America. There are so many success stories evident in the tales of people from these “Sithole” countries, their children in medical and law school, starting businesses, going to college, working job after job to move forward. They are natural and instinctive Americans, they’ve waited years to move forward and they can’t wait to do it. As many as there are, there are many million more left behind, and the odds of them getting out of those camps are dwindling by the day. Almost every refugee I meet has left behind a spouse, mother, father, grandfather, nieces, nephews, even older children. There are an estimated 67 million refugees in camps around the world today, according to the U.N. They are beginning to understand that they may never see these loved ones again, yet another cross to bear at an overwhelming time in life. So it was a special joy to see this banned festival performed with such joy and openness here in our country, where they are working so hard to fit in and move forward with their lives. It was a pleasure to see these refugees dance and sing today. I have never met people prouder and happier to be Americans, they are so much more grateful for their freedom, it seems, than the people who invented the idea. If you wish to help support them, you can donate to my refugee fund, Jon Katz, Refugee Fund, P.O. Box 205, Cambridge, N.Y., 12816, or contribute via Paypal, jon@bedlamfarm. com. Please mark you donation “refugee fund” if that’s where you want it to go. And thanks. 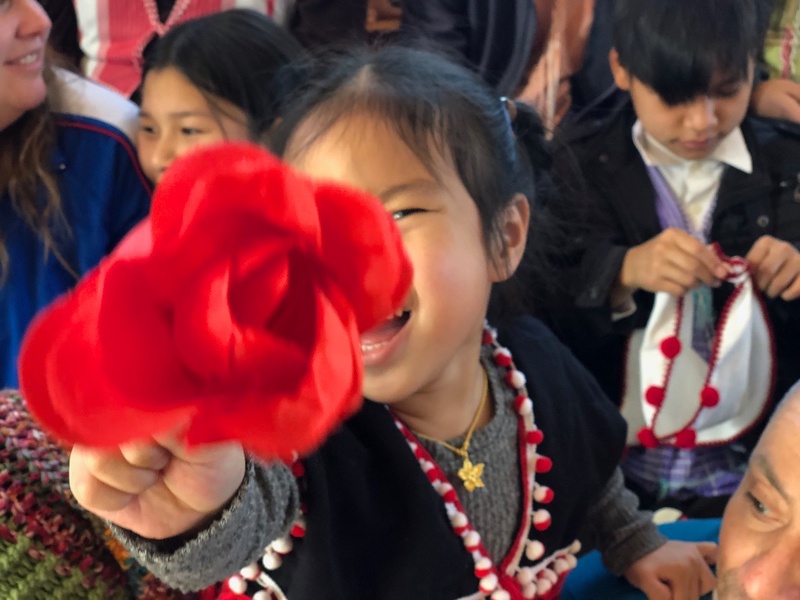 I met Khed at the Karen New Year’s celebration in Albany today, she has a beautiful red rose and she wanted to brush my camera lens with it, so I let her. She is a very sweet person and we had a great time with the Rose and I love this image of her. She is from Burma. Maria and I were invited to Albany today to see a gathering of more than 1,000 Burmese refugees from all over New York State to celebrate Karen, the annual planting of new crops. This custom is under fierce attack from the Burmese military, part of the ugly civil conflict in Burma. The celebration was held in a local middle school. It was standing room only. The refugees work hard to keep their culture and customs alive for their children, and we meet many of these good and hard-working people today. Their country definitely qualifies as poor and trouble, and they would likely be among the first kinds of refugees banned in the governments new push for affluent white refugees from places like Norway. These refugees would not quality. We just loved the depth of feeling in the dancing and singing we saw, and I’ll post more photos in a few minutes. Come and see some of the dancing that went on for six hours day. It is amazing how hard these kids worked to put on this kind fo dancing. 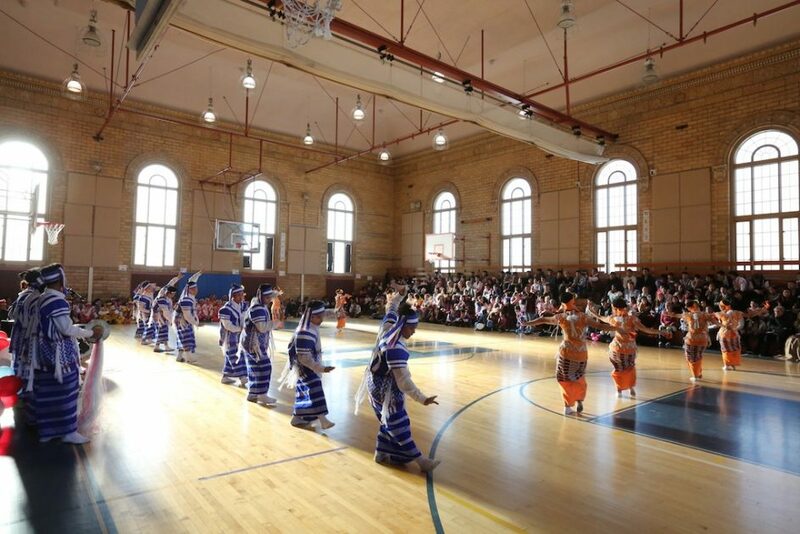 We went to a middle school in Albany today, we were invited to watch Burmese refugees from all over New York State in a Karen New Year celebration of a forthcoming successful rice crop. The first day of Pyathoe is not a distinct festival for any religious group, it is a day open to Karen people of all faiths. Karen New Year is celebrated throughout Burma, in refugee camps and Karen villages in Thailand, and Karen refugee communities around the world. In Karen State Karen New Year celebrations are sometimes harassed by the military government, or disrupted by fighting and civil conflict. There were more than a thousand refugees at the Karen celebration in Albany today, Maria and I were invited by Ali and officials of RISSE, the refugee and immigrant center in Albany. The RISSE soccer team and education programs have a number of Burmese refugees, and it was an amazing day for us, full of beautiful dancing and mystical song. More than a thousand people crowded into the school gym, and we were mesmerized by a culture and world we barely new existed, let alone had ever seen. I have to say it was also a wonderful celebration of the true meaning of diversity, people who have come to America to be free, but who work so hard to preserve the memories of their culture for themselves and their children. I’m grateful to Ali for inviting us. We loved every minute of it, and I’ll put up some videos and photos. The refugee experience is integral to the American experience in my mind, it has been a light to the world. Burma is one of those countries that is poorly and deeply troubled now, the festival today was stirring and poignant. We would be so much more of a barren country if we only permitted wealthy white people to come here, in a sense we are all citizens of the world. More photos to come. I sometimes call Maria my Willa Cather girl, she is a wondrous mix of energy, emotion, creativity, nature, animals and love. She has a fierce spirit. Someone messaged me and said Maria was the perfect partner for me, and this is very true. Yesterday in the howling winds and rain (it was 60 degrees, today it is -4) she went out to the barn to shovel the manure out to the pile, and the wind was practically bending her over, she was happy, in her element, busy, engaged, out in nature, caring for animals, keeping me from sliding on the mud and snow. She is an artist through and through, yet a farm person, what we used to call a farm wife. She almost melds into the chores, some of them muddy and hard, and then two hours later, will be obsessed making her new quilt, this time called “Being Warm” now on sale, a fitting title for a quilt in this season of brutal cold. This life is her life, it is natural for her, it combines her fierce creativity with her other passions – nature, animals, me hopefully. 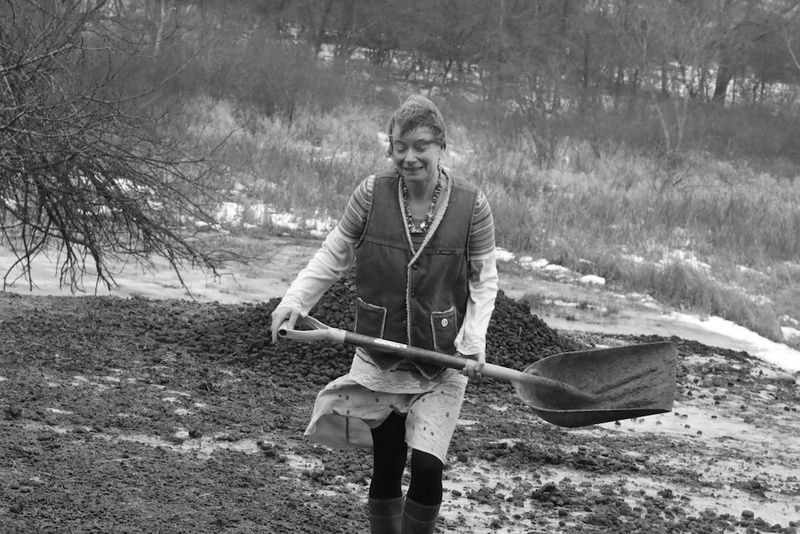 I love to photograph her, not only because I love her, but because she seems so much in her element here, even shoveling manure, she puts her own style and stamp on everything she does. Today, we shift gears again, heading for a Shithole Festival of refugees and immigrants, I am excited to be meeting some of the RISSE parents, and I am told they are excited to meet me, a strange figure to them, I imagine. Ali called this morning to say the soccer team found a place to practice indoors Monday, Martin Luther King day, but they will charge $10 per player. We’ll figure it out I told him. Ali hates to ask for money, he is afraid I will get sick of it and walk away. I will never walk away, he will figure that out one day. Maria is coming too, it is a Koran Festival, held at an Albany School. I’m bringing a check fo Maulidi the carver, clothes for Sifa and her children, snow boots for some of the RISSE kids, sweaters, shirts and toys for anybody who wants or needs them. And of course, money for the indoor practice. The soccer team is so important, a group of loving outcasts come together to learn how to live in America together. They must succeed.